Variety is the spice of life, as proven by today’s culinary consumer. The American public greatly values the opportunity to choose everything from where they want to dine, to what to order for dessert. Providing a buffet of choices is not hard with the right ingredients. 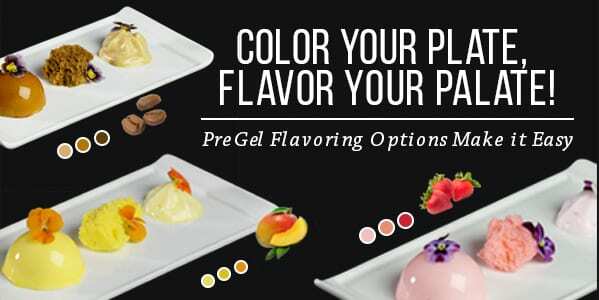 From mousse, to sponge cake and flavored dessert foam, and more, PreGel’s abundant supply of superior dessert ingredient solutions include high-quality Traditional Pastes, Fortefrutto® fruit-based pastes, and 5-Star Chef Pastry Select™ Compounds that aid innovative chefs in creating their best-selling desserts in a rainbow of flavor profiles. See our select products below for more information on how you can amplify the sweet choices on your dessert menu, and add some color to your dessert portfolio.